The Australia China Institute for Arts and Culture opened its doors on the afternoon of Saturday 27 May 2017 to observe the traditional Duanwu Festival, usually known in English as the Dragon Boat Festival. Director Jocelyn Chey spoke about the history of the festival, which dates back over one thousand years. It is usually associated with the patriotic statesman and poet Qu Yuan, who died in 218 BC, although there are other legends current in some parts of China and Taiwan. The custom of eating zongzi (sticky rice dumplings) relates to a legend that after he committed suicide by jumping into the Miluo River, rice was thrown into the river to appease his spirit. The bamboo wrapping was intended to prevent the river dragons from eating the rice. 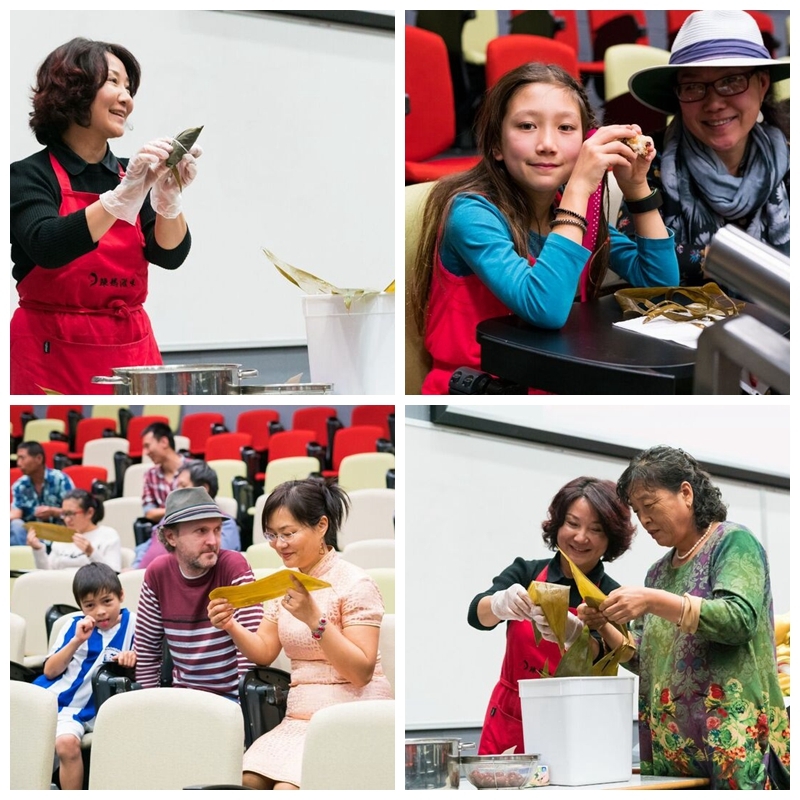 Maggie Li of Spicy and Yummy, Parramatta, demonstrated how to wrap the rice in bamboo leaves, together with a sweet or savoury filling. Jocelyn Chey also spoke about the significance of dragons in Chinese culture. Dragon boats are decorated with dragon heads and tails. Competitive dragon boat races have been held around the time of the Duanwu Festival for over a thousand years. This may be the sport with the longest continuous history in the world. Declan Gray, representing the Dragon Sports Association of Sydney, gave an introduction to the sport in Sydney today, where there are many clubs and several thousand competitors. Continuing the sports theme of the afternoon, Dr Bonnie Pang of the Institute for Culture and Society introduced her research into the cultural elements that influence Chinese people's participation in sport and physical activity. She noted that the Australian ethnic Chinese community has a very low participation rate, especially for teenage girls. Coincidentally, this event coincided with the national observance of Sorry Day on 26 May, when we remember the removal of Aboriginal children from their parents under former government policies, now abolished, and the 50th anniversary of the 1967 Referendum to remove clauses from the Australian Constitution that discriminated against Aboriginal people. It was therefore most appropriate to open the Institute Gallery and invite guests to view the exhibition titled, Warakurna, on loan from the National Museum. This exhibition of work by artists from the Warakurna community in the Western Desert, documents their removal from their ancestral lands to a government mission, their dream of returning, their eventual journey home and significant events since that time. The exhibition will be on show until August and is open during the week. Explanatory material is provided in both English and Chinese languages.